Today we are handing in a Change.org petition to the Secretary of State for Health and Social Care, Jeremy Hunt MP. 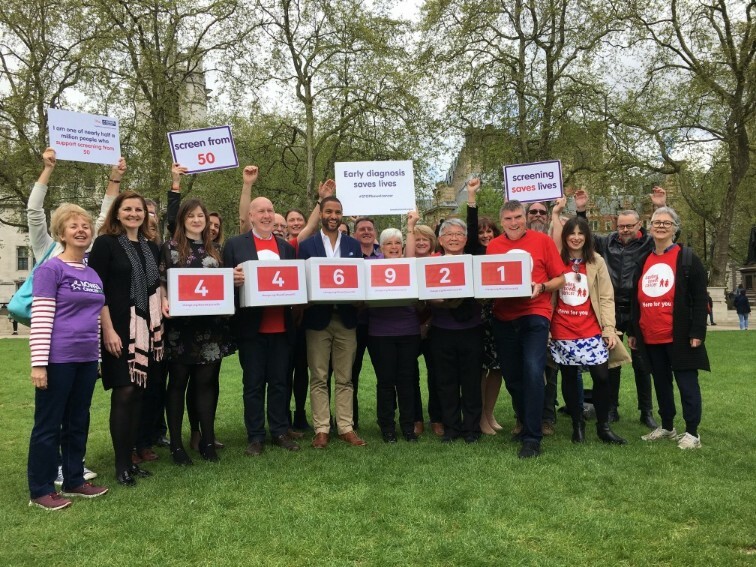 The petition, signed by over 445,000 people, calls for the bowel cancer screening age to be lowered from 60 to 50, in line with Scotland and international best practice. Lauren Backler, 27 from Eastbourne started the petition in honour of her mum who sadly died from the disease at 56 years old. She will be joined by her MP Stephen Lloyd, along with other MPs from across the political divide and Good Morning Britain and Countryfile presenter Sean Fletcher, whose mum died from bowel cancer. She will also be accompanied by supporters from the charity that were diagnosed with bowel cancer in their 50s or those that have lost loved ones from the disease after being diagnosed in their 50s. The petition hand in follows public announcements by former Health Secretary Lord Andrew Lansley and BBC George Alagiah talking about their personal experience of bowel cancer and calling on the government for an optimal bowel cancer screening programme. This includes screening from 50 using the simpler and more accurate faecal immunochemical test (FIT). Bowel cancer screening can prevent a cancer diagnosis through the removal of polyps (pre-cancerous growths). It is also the most effective method to detect bowel cancer at an early stage when it is easier and cheaper for the NHS to treat and there is a greater chance of survival. Currently people registered with a GP and aged 60-74 in England, Wales and Northern Ireland will receive a test in the post every two years. In Scotland, people aged 50 – 74 are invited to be screened. Screening people in their 50s can help to prevent a bowel cancer diagnosis in their 60s as it can take 7-10 years for a polyp that can be detected through screening to develop into a cancerous tumour. In 2003, the UK National Screening Committee recommended screening all men and women age 50-74 every two years. Despite this recommendation, it is only Scotland that screens this age range. Around 4,500 people are diagnosed with bowel cancer aged 50-59 and just over 1,200 die from the disease in this age group every year. If Lauren’s mum had lived in Scotland she would have been screened three times before she was diagnosed with bowel cancer, increasing her chances of an early diagnosis and survival. Lauren says: “Finding this out was a bitter blow. Nothing I can do can bring my mum back but I had to do something to spare other families and that’s why I set up this petition. Investment in staff and resources: An extra seven million people in England alone will be screened for bowel cancer if the age is lowered to 50. We need to ensure that the NHS has enough staff to deal with the increase demand on services this would cause in endoscopy and pathology. Demand for these services has been increasing dramatically but this hasn’t been matched with adequate investment and hospitals are struggling to keep up with the current need. Roll out the already-delayed easier to complete, more accurate bowel cancer screening test: NHS England have committed to replace the current screening test with the faecal immunochemical test, known as FIT, which can detect twice as many cancers, as well as significantly increase uptake. Scotland already rolled out this test in November 2017 and England was due to launch the test this month but this will now be delayed.The charity strongly recommend that FIT is introduced as a matter of urgency, as each month we delay implementation, more people are put at risk of a late diagnosis decreasing their chance of long term survival. The UK NSC report highlighted that an accurate FIT is cost effective for the NHS as it can detect bowel cancer early, when it is cheaper to treat. Deborah Alsina MBE, Chief Executive of Bowel Cancer UK and Beating Bowel Cancer, says: “We’re incredibly proud of Lauren and delighted to support her to hand in her petition to the Department of Health and Social Care this morning. Nothing I can do can bring my mum back but I had to do something to spare other families and that’s why I set up this petition. “We must do more to save lives from bowel cancer, after all it’s preventable, treatable and curable if diagnosed early. We urgently need an optimal bowel cancer screening programme that includes lowering the screening age to 50 years old and implementing FIT at a sensitive level. “We know that the price of bowel cancer to the NHS is at around £25,000 on average per patient. So investing in the screening programme now could save the NHS money in the long-run. “The government have a duty of care to use the best available screening test that detects the highest amount of cancers and screens all men and women between the age of 50 and 74, in line with international best practice. “To make this a reality in England, the Department of Health and Social Care must work with Public Health England and NHS England to create a more ambitious plan for screening, and ensure that the NHS has the endoscopy and pathology capacity to support improvements to the bowel cancer screening programme that could save thousands of lives. Find out about The Sun Online’s campaign No Time 2 Lose supporting us to call on the government to lower the screening age from 60 to 50.